- 3 BR, 3.5 BA, Sleeps 6-10. This is a beautiful, fully air-conditioned, 3-story private home located in the private, gated community of Phase 1 of Playacar in Playa del Carmen. Surrounded by lush tropical flowers and trees, this house is within walking distance of Mayan ruins, a tropical aviary, tennis courts, and the town of Playa del Carmen. It is 150 meters from the white sand beaches of the Caribbean. The 1st level features 2 bedrooms, each with 2 double beds and private baths. The 2nd level has a fully furnished kitchen and dining area, laundry room, and living area with entertainment center. The 3rd level has the Master suite with king bed, private bath, and two outside terraces, one with a beautiful view of the ocean. The fourth level is a rooftop terrace with Breathtaking views of the Caribbean and Playa del Carmen. In the garden you will find a refreshing swimming pool and more outside terraces. Location of the villa: Our villa is located in a private, gated residential area. 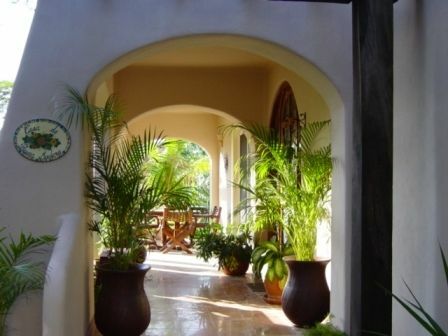 It is the only residential area of this type in Playa del Carmen that is close to the beach. Our villa is 6 houses back from the Caribbean. We have a great view, and it is about a 2-minute walk with direct access to the beach. We are also very close to the pier for the ferry to Cozumel - about a 5 minute walk. The famed 5th Avenue of Playa del Carmen begins just beyond the entrance to Playacar, Phase 1. First you will have the Paseo del Carmen which is an open-concept shopping mall which also has lots of restaurants and bars. At the end of the Paseo begins the 5th Avenue. This street is a pedestrian only street and runs from this Paseo north for about 4 miles. Along this street and its side streets you will find all sorts of shopping, restaurants, internet cafes, exchange booths, bars, night clubs, sports bars, coffee shops, travel agencies for arranging tours, etc. Safety: Some people are concerned about the safety of staying in a private home in Mexico. Actually, Playacar, Phase 1, has its own security guards. There is at least one guard about every two blocks who circulates through those blocks 24 hours a day. People are safe to walk back from town at night without fear of danger. Of course, you should always use caution. All bathrooms are furnished with tissue, facial tissue, towels, soap, hair dryer. In each bathroom is a purified water dispenser which the maid will keep filled for you. Great location and nice house! We stayed at the Villa for a week in March and had a great time. Bruno and the housekeeping staff were very responsive and helpful in many ways. The house is in a great location to 5th Ave and the beach. One thing to keep in mind is that there really is only 1 Master and the other two bedrooms, while large and have their own bathroom, require people to share. That can get awkward if you are a group of adults and want privacy. With that in mind, we had a great time and had everything we needed. We stayed in this home with our adult children and partners. The home was just as described with a private pool and less than a 5 minute walk to the beach. It is located in a private gated vacation community. Very quiet but close to 5 th Avenue and all the action if that is what you like. There was beer and wine the the refrigerator upon our arrival. We loved our stay here. This house has everything you need for a great stay in Playa. Short walk to a clean, lovely beach or to the shops on 5th Ave. Enjoyed the balconies for time out of the sun and the rooftop at night. Neighborhood is well maintained and loved all the bird calls in the morning. We managed without a car and just a few taxi rides from the grocery store. A real gem. The property was immaculate and very comfortable. My family and myself were very pleased with the house and will definitely stay again when we come to Playa del Carmen. Thank you for opening up your wonderful home to us! We enjoyed our stay at Buena Madera. It was everything we hoped it would be we all enjoyed ourselves. It was close enough to the beach and not far from the fifth avenue. Sadly our stay was too short and had to come back home to work. Thank you, Bruno, for guiding us to our location and hope we get to visit Playa Del Carmen very soon. In the area are all kinds of water sports including swimming, snorkeling and diving, boating, sailing, windsurfing, para sailing, jet-skiing, fishing. You can also go hiking, play golf or tennis, go biking, or wildlife viewing. In the town are lots of shops, restaurants, a cinema, and gymnasium. Nearby you can visit sites of Mayan ruins, ecological parks, and other parks such as Xel-ha, Xcaret, Tres Rios. We are 5 minutes from the ferry to the island of Cozumel. $300 - $450/night, 2000-$3000/week For reservations, a 50% deposit of the total rental rate is required immediately. The remainder due 30 days before arrival. For holiday season, total due 60 days prior to arrival. For normal rentals, if you cancel 30 days prior to your arrival, your full deposit will be returned. If you cancel less than 30 days prior to your arrival, you will forfeit your deposit. For Christmas and New Year's weeks, if you cancel less than 60 days prior to your arrival, your deposit will be forfeited. $500 damage deposit is required and will be returned in two weeks if no damage. Or you can purchase the travel insurance provided by this site.